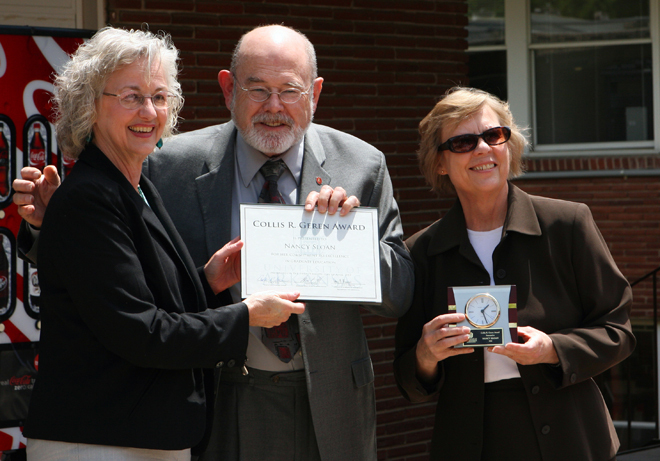 Nancy Sloan, being presented the "Collis R. Geren Award for Excellence in Graduate Education" from Dean Collis Geren and Associate Dean Patricia Koski. Faculty Award: Scott Mason, associate professor and associate head, department of industrial engineering; and director of distance education, College of Engineering. UA Staff Award: Nancy Sloan, program manager, operations management program. Graduate School Staff Award: Collis Geren, vice provost for research and dean of the Graduate School. The Collis R. Geren Award was established by the Graduate School in honor of the retiring vice provost for research and dean of the Graduate School, Collis R. Geren, for his commitment to graduate education and student success. During his 19 years as dean of the Graduate School, Geren has contributed greatly to the success of graduate education throughout the State of Arkansas. The awards were presented at the Graduate School Appreciation Cook-Out held Wednesday, April 28th at the new home of the Graduate and International Admissions and Recruitment Office, Stone House North, 346 N. Arkansas Avenue.